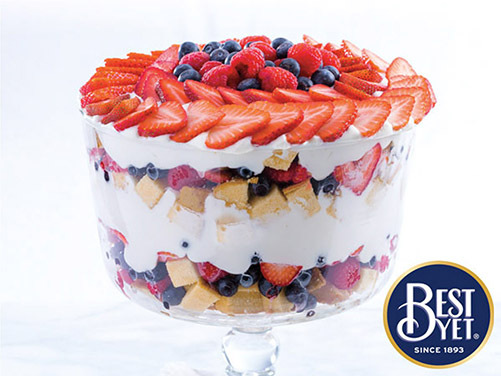 4.In bottom of 3- to 4-quart glass trifle dish, layer 1/2 of the pound cake, 1/2 of the berry mixture and 1/2 of the pudding mixture. Repeat layers with remaining pound cake, berry mixture and pudding mixture. Arrange reserved strawberries, blueberries and raspberries on top. Cut pound cake and store in an airtight container; toss berries with sugar and prepare pudding, and refrigerate up to 1 day ahead.